Where the hell is Wirtz? We are frequently asked if The Virtual Corkscrew Museum is a real museum in Wirtz, Virginia. The bad news is no, but the good news is that the museum is open 24 hours a day, every day on the Internet! And the admission is always free! The next question we are frequently asked is "Where the hell is Wirtz?" Wirtz is in Southwest Virginia and everytime we leave, we have been fortunate in finding it again! It's great country, but slim pickin's for corkscrews. 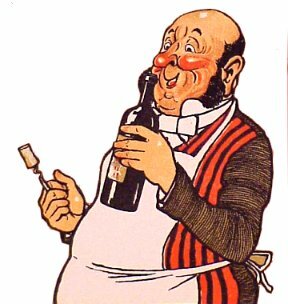 Being in the County that is the Moonshine Capital of the World, one can find many jars with twist off lids, but, sadly, nary a corkscrew! The other thing that found its way to Wirtz is a corkscrew from corkscrew collector friend Klaus Pumpenmeier. 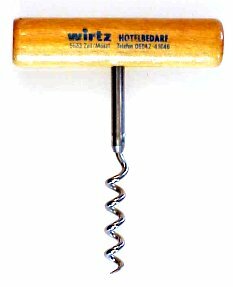 He actually found a corkscrew that is imprinted with Wirtz Hotelbedarf (Wirtz Hotel Supplies), located in Mosel. Thank you, Klaus! Boxes Full of Corkscrews can find their way to Wirtz, too! Just mail them!